The Story of Chalk Streams is WCSRT's unique education programme that introduces school children to chalk streams, their past and present and the life that abounds in them. 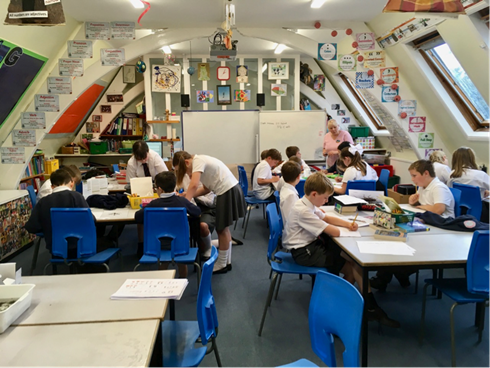 The lessons can be held indoors or outdoors and are closely linked to the primary national curriculum (Key Stage 2 Science, Geography, Mathematics and other subjects such as History and Art and design). 1. The lesson opens with the study of chalk, the white porous limestone that helps to keep the water in our chalk streams clean and cool. Small rocks of chalk are handed out for observation and children discover (via enquiry) when and how this rock was formed and its special qualities. 2. The lesson then moves onto chalk streams, which appeared during the last Ice Age when gushing flows of melting ice carved these rivers into the landscape. Children hypothesize about the various events that would have occured 10,000 years ago and how these would have influenced the conditions and wildlife found in our chalk streams today. 3. A sample of invertebrates and small fish is collected from a local chalk stream (by WCSRT's Education Officer) and brought into the classroom for inspection and analysis. Children learn about the many different insects that have developed unique structures and functions that enable them to live in water. 4. The lesson closes with a drawing activity of an invertebrate or fish found in the sample, which enables children to study the chosen invertebrate/fish in more detail. Please contact Vee Moore at education@wcsrt.org.uk to get your school involved or to request more information. 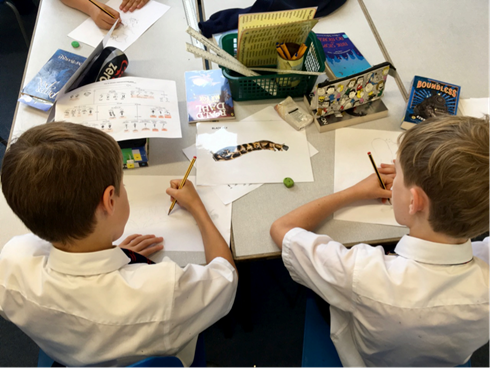 In partnership with the Wild Trout Trust, WCSRT runs Mayfly in the Classroom in primary schools across the Wessex region. 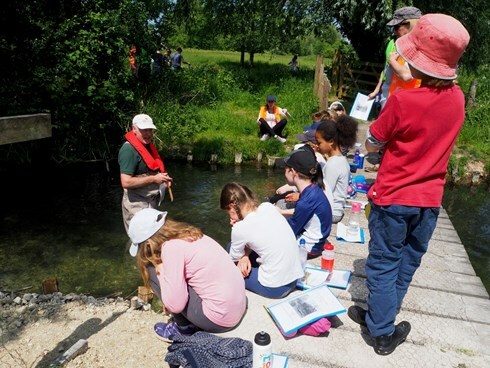 The programme aims to connect school children to their local river habitats and uses the lifecycle of mayflies to teach them about the broader themes of biodiversity, ecology and the links between aquatic and terrestrial biodiversity. Children catch mayfly nymphs from their local river, build their own hatchery out of old plastic lemonade bottles and then release adult mayflies back to the river. Mayfly in the Classroom runs in the summer term and lasts about two weeks. It's suitable for all ages. Mayfly in the Classroom is both cheap and easy to set up and a variety of activities can be run alongside it to make the experience as hands on and interactive as possible. WCSRT supports the schools involved with mayfly sampling and hatchery setup. If you would like to find out more about the programme or would like to get your school involved please contact Vee Moore at education@wcsrt.org.uk. 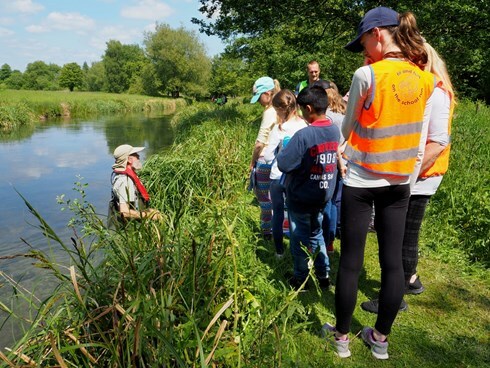 In 2015, the WCSRT began collaborating with Winchester College and local primary schools on an environmental education programme to introduce pupils to the River Itchen and help teach them about their local chalk river systems and all the wonderful wildlife these rivers support. Each school term, 100-200 pupils from Winchester-based primary schools benefit from the programme, which includes a preliminary lecture by the Winchester College teaching staff, followed by both laboratory and field visits to the River Itchen in the College grounds to collect and identify small fish and invertebrates from the river and introduce the youngster to the basic concepts of river hydrology. The enthusiasm and interest shown by the children is boundless and often this has to be sustained during cold and wet early springtime or autumn weather. Highlights from the visits include the temporary capture and inspection of sticklebacks, minnows, bullheads, stone loach, mayfly and damsel fly nymphs, shrimps, snails, leeches and caddis larvae: much to inspire young minds! We are often fortunate to have the help of TV wildlife presenter, Nick Baker who is the Fellow of Natural History at the College.